As we head into the playoff run, let’s compare the 2009 World Champions Yankees as opposed to this year’s model. On September 21st 2009, the Yankees were just coming off a terrible loss, where Joba Chamberlain—mired in his innings-crunching Joba Rules—gave up 7 runs in 3 innings to the Seattle Mariners. The Yankees were 1 for 11 with runners in scoring position. But Mark Teixeira hit his 42nd double of the year and Sergio Mitre pitched 5 1/3 innings of shutout ball. In the end, it didn’t matter much because the Yankees still ended the day 5 games in front of the AL East. The 2009 Yankees were a better hitting team. Across the board, in every category, the 2009 model was a better hitting, slugging and on-base percentage team. What happened? Well, let’s start with Derek Jeter, who at this point last year was batting a shocking 65 points higher than he is this year. Let us then proceed to Mark Teixeira (batting average a whopping 36 points lower this year), Posada (23 points lower this season) and Granderson (25 points lower than center field counterpart Melky Cabrera). The lesser batting continues with a lower 2010 slugging percentage. 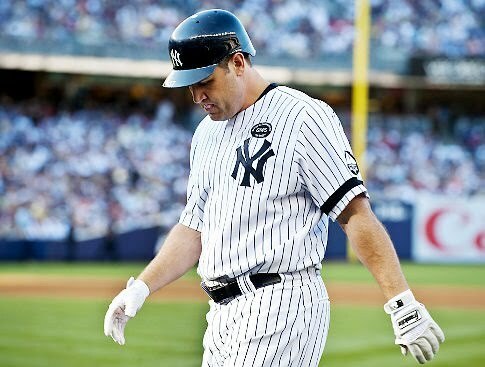 Teixeira is down this year for both homers and doubles as is Derek Jeter. Rodriguez’s slugging percentage is down 34 points from last year, and Hideki Matsui’s 2009 slugging numbers from the DH role dwarf this year’s DH Frankenstein of Lance Berkman, Nick Johnson, Marcus Thames, and Austin Kearns. Overall the 2009 Yankees had an OPS+ of 122; this year, it is 109+. Conversely, this year’s staff bests last year’s, statistically speaking. The 2010 Yankee staff has a collective ERA of 3.91, while last year’s had a 4.26 ERA. That may seem a little odd with Burnett struggling badly and Vasquez pitching like a precocious 6th grader. Remember though, last year’s squad had only had 3 reliable starters heading into the playoffs. This year, assuming Pettitte’s health, the Yankees have Sabathia—who’s pitching better this year— Pettitte, Hughes and even Ivan Nova, with Burnett a possibility for the rotation should he regain his form, and Vasquez as long spot relief. Last year’s staff had an ERA+ 101, while this year, that number jumps to 111. The HR/9 number is down from 8.6 to 8.3, as is the BB/9 from 3.6 to 3.3. The K/9 are down, though, this year from 7.8 to 7.2. Overall though—and it’s a big assumption, considering Nova and Hughes’s age (23 and 24 respectively), and Pettitte’s health—this year’s starters are a little more solid overall. This year’s pen, with Wood, Logan Robertson, Chamberlain, Gaudin, etc, matches up favorably with last year’s pen. On September 21st, 2009, the Yankees lost in L.A. to the Angels. After that, they went on a 7-game winning streak, jumping to a 10.5 game lead. Mixed in that stretch was a shockingly decent performance by Joba Chamberlain against Jon Lester and the Red Sox, going 6 innings and giving up only 3 runs. 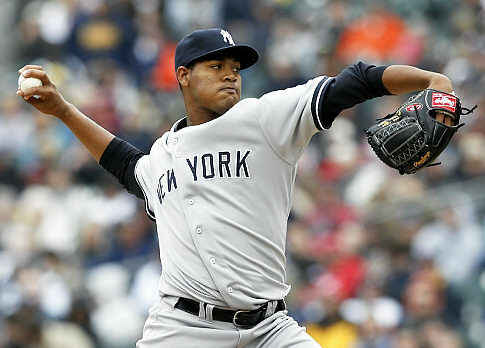 A-Rod hit 5 home runs in the last 2 weeks, and the Yankees were able to set up their rotation for the playoffs. A similar end of September is needed for this year’s Yankees. While the Yankees may not have the overall depth and playoff experience they did last year, they definitely should be playing better than they are right now. The biggest necessity for the 2010 Yankees is to get the bats alive again, both the starters and the bench. So far, in September the Yankees collectively are batting just .259 and just slugging .388. Hopefully, Swisher, Gardner and Teixeira playing healthy again can help with that problem. They’re going to have to; the Yankees last 12 games are all against teams with records over .500, and with 9 of them being against the Red Sox or Rays. While the Yankees don’t have the depth of last year’s bench and they don’t have the luxury of as many reliable choices, they still aren’t exactly poor of options. Austin Kearns, Lance Berkman, Marcus Thames are all capable of quality at-bats. They just need to go out and do it. Here’s an interesting fact: this year, according to baseball-reference.com, Yankees substitutes are batting .237; last year they were batting .313. Late in 2009, the Yankees were able to patch together a stretch run with Chad Gaudin, David Robertson, Phil Coke, Joba Chamberlain pitching a few innings a start, and Alfredo Aceves playing the role of Mr. Anytime A. Anywhere. Like the hitters, the Yankees have the tools to make a similar run this year; they just need to go do it. Hughes can pitch like an all-star when he’s got his mechanics down pat. Burnett has dominant stuff when he can locate it. Chamberlain is lights out when his head is on right. They need to go out and make it happen. The Yankees, according to Las Vegas odds makers, are still the team to beat this year. And they should be. And just like last year, they need to rise to the challenge. while it may seem odd to say coming from a fan of a team that is out of it, I think LY's team was scarier. I get that statistically this years team is much better pitching. Last years team however scared you 1-8.5 in the order. Melky was probably the only significant soft spot in the order, maybe Swish and Chips (see if you can name that NYC reference) too. While this years team may be one of the teams to beat, I think last year there wasn't much doubt they would win it all . I think the stats are deceiving because pitching around MLB is better in general this year than last year. Or teams are not hitting as well. The Yankees are tops in runs scored in the league, as they were last year, and their team rank in pitching is similar as well (12th vs 11th in the league). In relative terms, they are about identical. What they need is a third starter, much like the Braves needed and neglected to obtain. This is why the Phillies have overtaken them and they are in danger of not making the play-offs at all. Oswalt with the Phillies is 7-1 since the end of July. I told you, Blue Meanie. I agree, and did agree with you that the Braves needed Oswalt. But I hold my opinion that it is not the year to mortgage the future to get him. Despite the strong year the Braves have had they are a very flawed team. Getting Oswalt and possibly winning the division, possibly getting the wildcard isn't the end all. I didn't and still don't think the cost of getting Oswalt would have propelled them to a World Series championship. Future players and the cost of Oswalts existing contract remained too steep a price. If the Braves had the Phillies lineup or equivalent, yes, the time was this year to strike to win it all. Flawed teams that believe getting to the postseason at any cost are suckers for the smart teams. Smart teams take advantage of teams like the Braves (this year). If the Braves don't get the wildcard, so what? Their flaws would have been too much to overcome against less flawed playoff teams.